While we were living in Saudi Arabia, a friend and fellow modeler, Howard Hupe, challenged me to a PT boat building competition. His challenge was prompted by the Dumas company sale on their PT 109 model kit. So we each bought a kit and built a model. 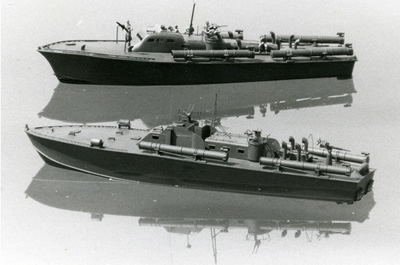 In the process of researching PT boats to "kit bash" the model, I found the PT boaters' organization, now on the web at http://www.ptboats.org, and also Al Ross, Jr's fine plans. 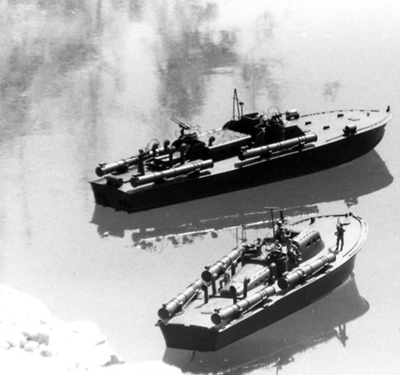 Al was then running "Coastal Forces" and had plans for PT boats and the Vietnam era river patrol boats. The plans were (and are) superb, and are available from the Floating Drydock at http://www.floatingdrydock.com. It was later, when I was building a model of the PT-34 and in communication with Al Ross that I found out his father, Al Ross, Sr had served on the PT-34. 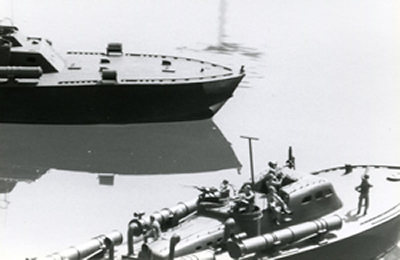 PT 34 and PT 109 models afloat in a pond in the Diplomatic Quarter in Riyadh, Saudi Arabia. A long way from the Pacific. I like this photo, because it shows the differences between the two ELCO hulls. The 77 footer much more resembled the earlier prototype, the 70 footer designed by Hubert Scott-Paine of England. The 80 foot boat was very different and easier to maintain and service. Another shot of the two models. In this view, you can see the larger after cabin which provided more space for crew and also easier access to and ventilation for the engine compartment through a large hatch and ventilators aft the cabin.